who is this cole character? In case you were curious, cole slaw is not named for any fella named Cole. The term comes from the Dutch word "koolsla," a shortening of "koolsalade," which means "cabbage salad." In case you were curious. This post is about my tragic lack of cole slaw, which would so enhance this already-glorious chicken barbecue. 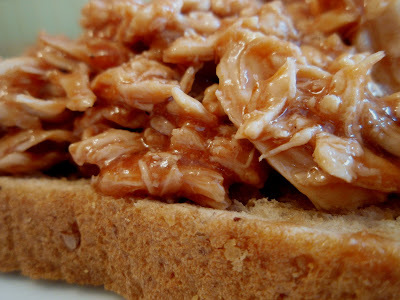 I resisted slaw for many years, and even now I really only enjoy it on a barbecue sandwich. I'm extremely picky about it (surprise, surprise) and that's why you don't see any included on this particular sandwich. The very best slaw I ever put between my lips comes from the deli in my hometown grocery store. I can't even pinpoint what makes it so marvelous, but I do know that so far, no homemade or store-bought version that I've tried can compare. If you have a killer cole slaw recipe (minimal mayonnaise, please)(ick), feel free to share! 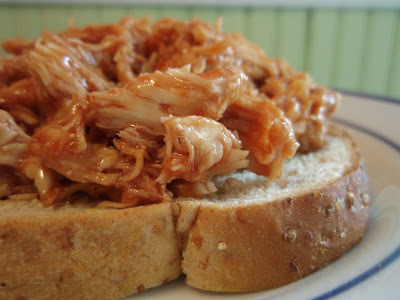 Chicken barbecue is good (especially when the barbecue sauce is sweet and spicy)(I used a honey-chipotle blend), but with the proper cole slaw, it becomes phenomenal. P.S. Happy birthday, big brother! Have you ever wondered why monkeys are so commonly associated with bananas? I have. I mean, it's not like they don't eat other things, like spiders. Now before you say anything, yes, I baked. You didn't expect me to quit completely, did you? This time, I didn't share with my immediate co-workers but instead took the goodies to another department. The reactions I received from those folks were much more favorable, and who knows--maybe word will get back to my office area and jealousy will ensue. Maybe there'll even be an inter-departmental battle for my delicious treats. Moving on. I had some bananas loitering in my freezer that I really wanted to use. I initially wanted to make monkey bars so I could segue into my love of that particular playground apparatus. (I could really fly across those suckers.) In the end, however, I chose to go with a bread, using an ice cream concoction from Cold Stone Creamery as my inspiration. 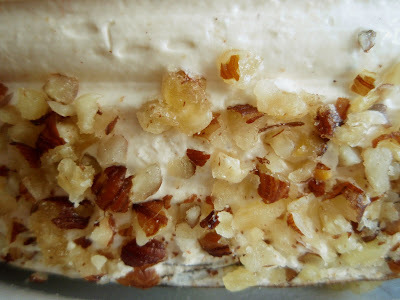 Their creation is called "Monkey Bites," and it combines banana ice cream with pecans, coconut, Nestle crunch bar, and bananas. So I ask again--what does it have to do with monkeys? Rabbits also apparently love bananas, so why can't it be called Bunny Bites? This is the kind of stuff that keeps me awake at night. But I digress. The base recipe is for peanut butter banana bread, and I simply added chocolate chips and pecans into the batter, and coconut on top (of some). Voila--mission complete. 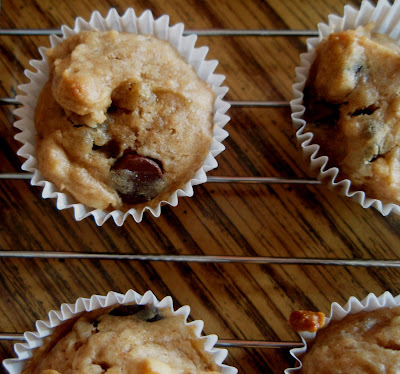 These are not your typical muffins or bread. The batter was extremely stiff--in fact, I truly believe I could've made cookies out of it. This was further validated by the fact that the spoonfuls (there was certainly no pouring to be done) didn't spread at all in the muffin cups--their shape was exactly the same before and after baking. That's not to say the result wasn't delicious--it was. It was just a bit more dense and cookie-ish than I expected. No worries--I'll bet neither monkeys nor rabbits would turn it down. Preheat oven to 350 degrees F. Line or spray a muffin tin, loaf pan, or other suitable baking vessel. In a large bowl, stir together the flours, sugars, baking powder, salt, and cinnamon. In a separate bowl, combine the mashed bananas, milk, peanut butter, oil, vanilla, and egg (I blended mine with a mixer). Add the wet mixture to the flour mixture, stirring until just combined. 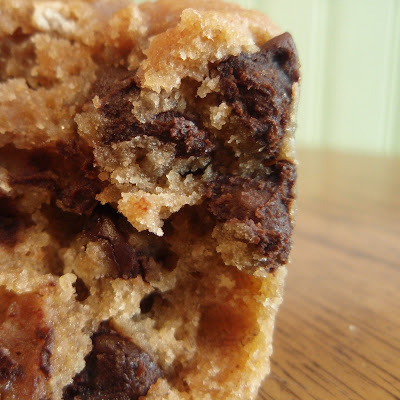 Toss the chocolate chips and pecans with a bit of flour and stir into the thick, thick batter. Spoon the batter into the prepared dish. Bake about 15 minutes for mini muffins and about 30 minutes for mini loaves, or until a toothpick inserted near the center comes out clean. Try not to overbake. It's a crying shame that I spent so long disliking peas. Yes, I'm sorry to say that the majority of my childhood was spent avoiding peas at all costs. Even when my grandma made her delicious peas & dumplins, I would serve myself two or three dumplins...and two or three peas. I'm not sure when my conversion occurred, but now I enjoy the peas more than the dumplins and am always on the lookout for dishes containing the little green orbs. I guess I'm making up for lost time. 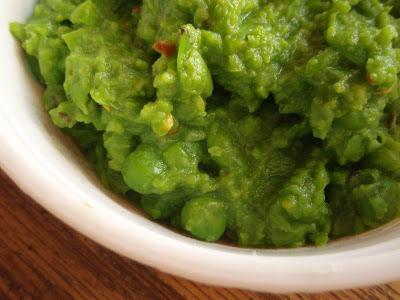 I thought this pea puree would be tasty, but it far exceeded my expectations. The mint, which I don't believe I've ever used in a savory dish before, was absolutely delightful and the perfect complement to the pea flavor. The addition of the red pepper flakes was a spur-of-the-moment decision, and it was a good one. What can I say, I love to set my mouth on fire. Admittedly, this may be a bit too pea-quant (get it?? get it?? )(it's okay to groan) for some folks, but like I said--I'm making up for lost time. Cook the peas in boiling water for 3 to 4 minutes, or until they can be easily pierced with a fork. Drain and pour into a food processor. Add the milk, mint, salt, and red pepper flakes and puree. Taste and re-season as needed. Apparently, this type of thing makes a wonderful accompaniment to lamb and various types of fish. Frankly, I enjoyed it by the spoonful. I've decided to cut my co-workers off for awhile as a form of passive-aggressive punishment. They simply aren't displaying enough, or frankly, any gratitude for my baking efforts. 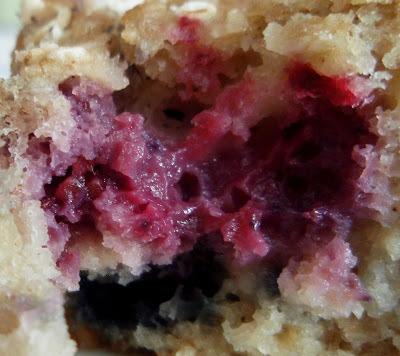 Granted, these muffins weren't my best creation, but there was still time, money, and care involved. So in an attempt to spur some appreciation, I'm going to put a temporary kibosh on the baking. 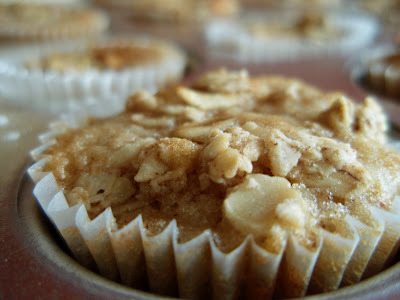 Okay, enough of my subtle vindictiveness and on to the muffins. They are yet another example of Eb's capabilities. However, for the first time, I think he was too potent for his own good. The sourdough flavor was just a bit overwhelming for my tastes, and it definitely overpowered the apples. I couldn't even detect the cinnamon, which is clearly unacceptable. 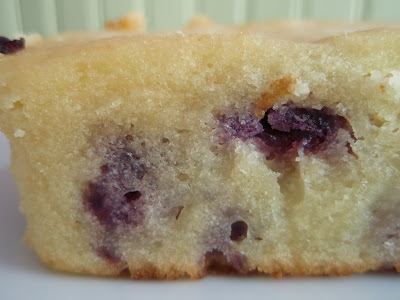 Other than that, they were super-moist and had an excellent texture. I topped them with some granola I had hanging out in my cabinet, and that provided a welcome crunch. 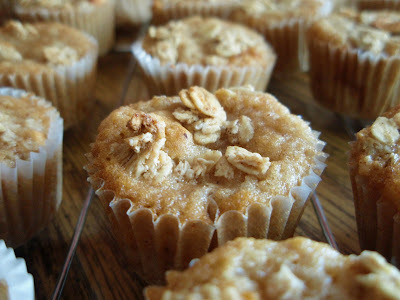 If I make these puppies again (for a more worthy crowd), I'll boost the sugar and cinnamon and perhaps use a streusel topping instead of that granola. In a large mixing bowl, cream together the butter, sugar, and eggs until light and fluffy. Add applesauce, vanilla, and starter and mix well. In a separate bowl, combine the flour, baking soda, baking powder, salt, and cinnamon. Add the dry ingredients to the wet ingredients and mix thoroughly. Pour into the prepared pan(s) and sprinkle the tops with granola. Bake until the toothpick test is passed. (My mini muffins took about 20 minutes, and the regular muffins and mini diamond loaves took about 30 minutes.) Cool on a wire rack. The output of my tomato plants was disappointing to say the least, but I've people to take care of my needs. My buddy at work brought in a bag full of big, red, juicy maters and I took (probably more than) my fair share. Since I couldn't possibly eat them all before they rotted, I decided to make some soup. It's still pretty toasty in these parts (it hit 90 degrees the other day), so I went the chilled route. Sadly, I'd never peeled tomatoes before this, but it was pretty much as easy as breathing. Also, I had no idea that bread was involved in this sort of thing, but fortunately I had some really old bread lingering in my fridge that fit the bill quite nicely. My picture is a bit misleading--this was an extremely pink soup. It looked unlike any tomato soup I've ever seen, and I can't figure out why. I suppose it was the type of tomatoes used or the fact that they weren't cooked. Regardless, it's a really tasty and light soup. Soak bread in cold water briefly and squeeze dry. Combine in a bowl with the tomatoes, basil, and stock. 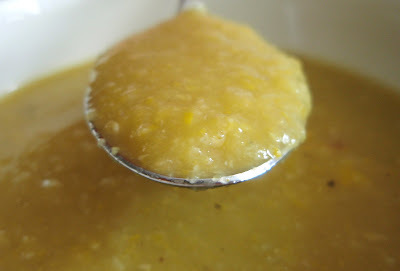 Using an immersion blender or other blending apparatus, puree until smooth. Season with salt and pepper, then add lemon juice and sugar to taste. Chill and serve. Kelly of Sass & Veracity is about to celebrate her 100,000th visitor, so I want to use this delightful dish as my contribution to her party. Even Gordon Ramsey couldn't turn this away. Although I would never reject a chocolate-mint, chocolate-raspberry, chocolate-coconut, chocolate-chocolate, or chocolate-caramel combination (you get the point, yes? ), you'd have trouble convincing me that anything was better suited for chocolate than peanut butter. It's a magical union (most unlike that of, say, Kenny Chesney and Renee Zellweger) to be sure. I can't quite describe exactly what makes them so perfect for each other, but their compatibility is undeniable. 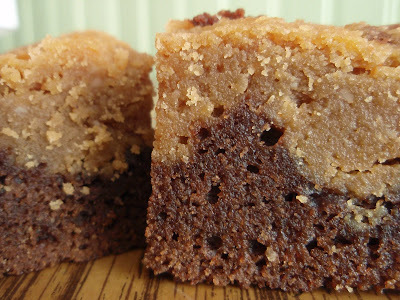 Scads of peanut butter brownie recipes are floating around out there. 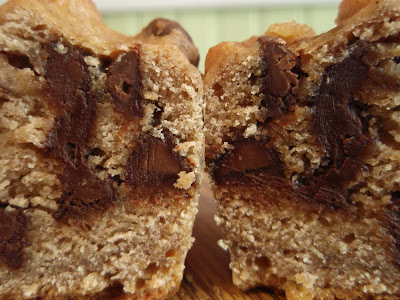 Some are brownies with peanut butter chips, others are peanut butter blondies with chocolate chips. Some have a peanut butter swirl, others have an entire layer devoted to peanut butter. Frankly, any of those would please me but on a whim, I chose the latter. 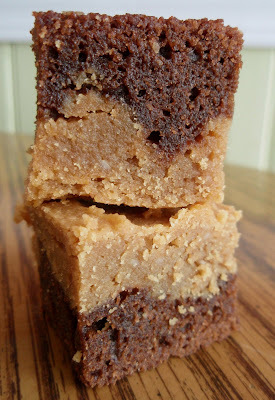 I opted to blend two recipes for these brownies. For the chocolate portion, I referred to Kristin of The Kitchen Sink, in whom I have complete and total confidence. However, I wanted a more substantial peanut butter flavor, so instead of using her peanut butter swirls, I went with a recipe from Slashfood. 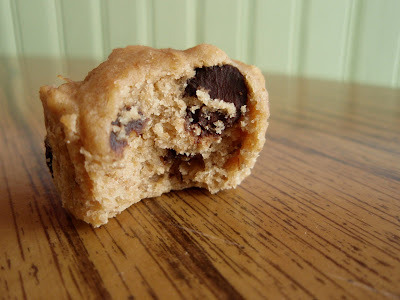 Honestly, I don't think it would be possible to screw up such magnificent ingredients, and even though I had a bit of trouble spreading the peanut butter portion onto the chocolate part, the end result was still delectable. Preheat oven to 325 degrees F. Grease an 8x8-inch pan. To make the chocolate portion, melt the butter and chocolate together in the microwave (or the top of a double boiler, if you're fancy like that). Let cool slightly. In a separate bowl, whisk together the flour, baking powder, and salt and set aside. Whisk the sugar into chocolate mixture. Add the eggs, and whisk until the mixture is smooth. Stir in the vanilla. Add the flour mixture and stir until well incorporated. Pour into prepared pan. For the peanut butter part, beat together all the ingredients until smooth and creamy. Spread as evenly as possible on top of the brownie batter in the pan. 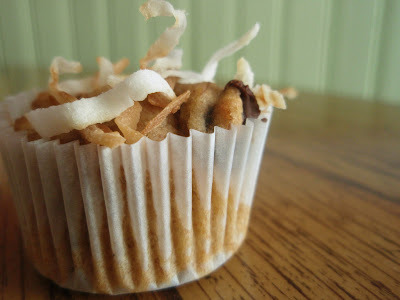 Bake for 40-45 minutes, or until a toothpick comes out with a few crumbs attached. Let cool, cut into bars, decide which flavor you want to hit your tastebuds first, and insert into mouth accordingly. For some completely inexplicable reason, I recently recalled a dessert from my childhood. Once the memory had re-emerged, I couldn't escape it and began craving this particular dish like no other. Has this ever happened to you, or am I even more peculiar than I thought? Back home, we have a fellowship meal after church every third Sunday. Our congregation is composed of extraordinarily talented home cooks, so the food is always delicious. I, for one, always eagerly anticipated the meal and often got squirmy during the sermon. The dessert in question was one that was brought in by my aunt, one of the best cooks in the congregation. 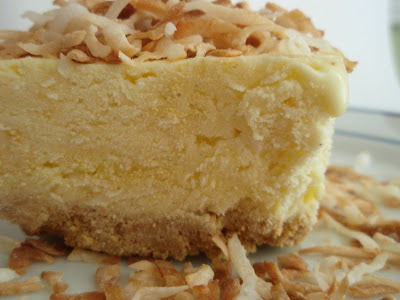 My initial memory of it was that it was frozen, involved coconut, and had a crumb crust. After quizzing the Mambino and my cousin (also a fabulous cook), I was finally able to recreate the dessert for myself. And yes, it was everything I remembered and more. 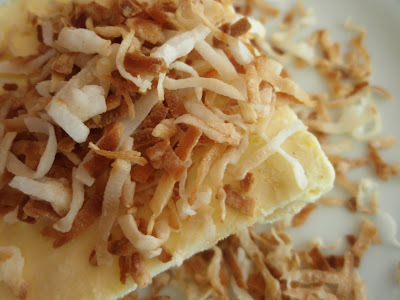 Creamy, coconutty, cold, and crunchy. It was easier than anything to put together--the hardest part was waiting for it to set up in the freezer. Mix crackers and butter and press into a 9 x 13-inch pan. In a large mixing bowl, combine the ice cream, milk, and pudding mixes and stir well. Pour mixture over the crust. Top with Cool Whip (if you have a brain and remembered to buy some) and any additional crushed crackers and/or toasted coconut. Put the dish in the freezer for at least an hour. Set out 10-15 minutes before serving. George: "Double-dipped"? What are you talking about? Timmy: You dipped the chip. You took a bite. And you dipped again. Timmy: That's like putting your whole mouth right in the dip! From now on, when you take a chip, just take one dip and end it! George: Well, I'm sorry, Timmy, but I don't dip that way. Much like George Costanza, I enjoy a good dip. If we're at a party and you can't find me, chances are I'm hovering around the dip. So what defines a good dip? To me, the most important thing (aside from taste) is that it be viscous enough to stay on the dipping utensil. Other than that, I'm not too picky. It can be hot or cold, smooth or chunky, sweet or savory. This dip is one of my all-time favorites. 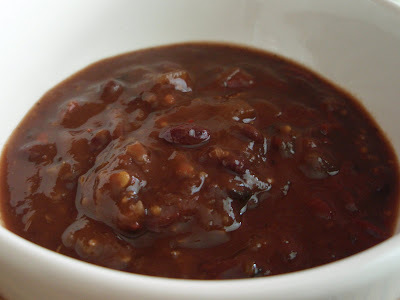 It's like a smooth salsa, but with black beans thrown in the mix. I'm of the opinion that black beans can only enhance a dish. Even brownies. But I digress. 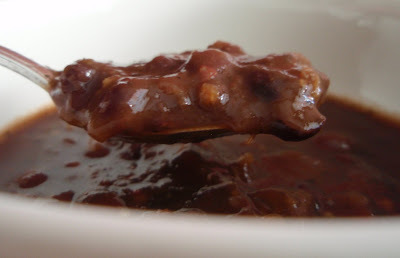 This dip is so good, I'm offering it to Susan of Sticky, Gooey, Creamy, Chewy for her Blogiversary Bash. I'll try not to eat it all before the party. 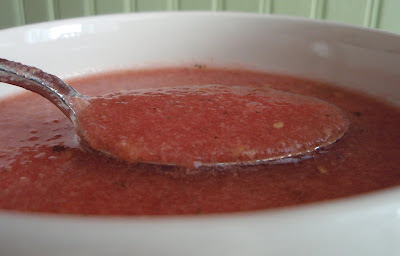 Puree the tomatoes and 1 cup of the beans until your desired consistency is reached. Stir in the remaining black beans and other ingredients and season to taste. 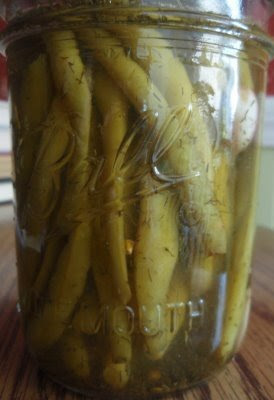 Some of you expressed interest in the Mammy-made dilly beans I mentioned in my squash soup post, and I'm happy to say that she was glad to oblige. -Also put in one clove fresh garlic, 1/4 teaspoon red pepper flakes, and a small head of dill. -Heat together 1/2 cup sugar, 1/4 cup salt, 2 cups vinegar, and 2 cups water. Fill jars with this hot syrup. Screw on new lids and process 10 minutes in a hot water bath. -Make up the syrup again as needed since the amount required is correlated to how tightly packed the jars are. -Of course, you can substitute other forms of garlic, peppers, and dill. They are delicious, and frankly, I'm upset that I only came back with one jar. Meanwhile, I've been a naughty bloggerino. I've been sitting on a couple of awards that I need to acknowledge and pass on. I was honored to receive the Brillante Weblog award from OhioMom of Cooking in Cleveland, Kelly of Sass & Veracity, Lucy of Sweets, Savories, etc., Bunny from Bunny's Warm Oven, and Helene of La Cuisine d'Helene. I sincerely thank you all! I was also recognized by Lori of Luscious with the I Love You This Much Award. As a native Texan living in Manhattan, she chose to pass it on to other bloggers who are a bit out of place (location-wise) and center their blogs around it. Great idea, Lori! I want to pass this award on to a few gals who've quickly become some of my favorite bloggers: Nat of Hot Off the Garlic Press, Erinn of Sunday Dish, Tiffany of The Garden Apartment, and Veronica of Supermarket Serenade. Four ladies, four crackerjacks. If you don't know them, you should. You'd think that the combination of a sourdough starter and lemons would lead to an extremely sour product. Ah, the power of sugar. Yes, my friends, Eb has returned. I continue to be amazed by his versatility. His goal this time was a lemon cake. For the record, I (along with the babies in this hilarious, must-watch video) am not a huge fan of lemons, but the recipe I found was unique and interesting, so I gave it a shot. I was a little bit hesitant to take that first bite of finished product, but my fears were unfounded. In fact, if I hadn't made it myself, I never would've known that a sourdough starter was involved. There was a bit of that telltale tanginess in the background, but nowhere near the amount I expected. Lemon was definitely the predominant flavor, but the overall effect was actually pleasantly sweet. And of course, the glaze didn't hurt. I took most of the cake to work and it was devoured. You'd think these people never get fed. Unfortunately, I'm beginning to take issue with the fact that my co-workers have stopped thanking me for bringing in these goodies. A girl likes to feel appreciated! I'm sorry to say that I can be a bit of a spiteful person, so if I don't get some gratitude soon, I'll be forced to stop feeding them. Preheat oven to 350 degrees F. Spray a 9-inch loaf pan or a mini loaf tray. 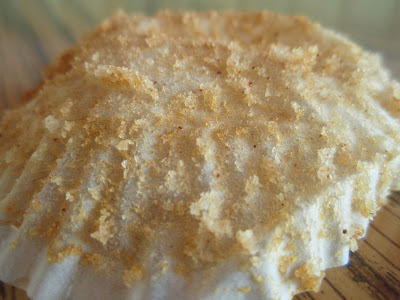 In a large bowl, cream the butter with the sugar and grated rind until light and fluffy. Add the eggs one at a time, beating well after each addition. In a separate bowl, combine the flour, salt, and baking soda. In another small bowl, combine the lemon juice, water, and starter. Add the dry ingredients to the butter mixture alternately with the lemon mixture, beating until fluffy. 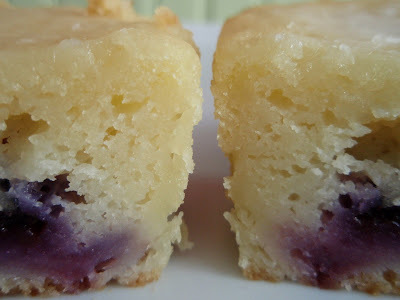 Coat blueberries with flour and fold into batter. Pour into the prepared pan and bake 1 hour, or until bread tests done (my mini loaves took about 40 minutes). Let the bread cool in the pan on a wire rack for 10 minutes. For the lemon glaze, combine powdered sugar, lemon juice, and enough water to make a creamy frosting and mix thoroughly. Remove the bread from the pan and pour on the glaze. 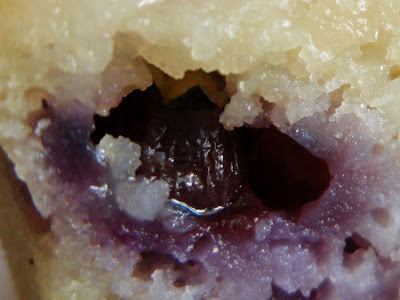 I'm contributing this to YeastSpotting, a weekly feature of the wonderful blog Wild Yeast. People must sense my need for homegrown produce because when I went back home to Virginia a couple of weeks ago, I returned with a box full of squash (and about 15 ears of corn and those stupendous Black Russians and some sensational Mammy-made dilly beans). So what did I do with my glut of summer squash? Why, I squashed it up, of course. 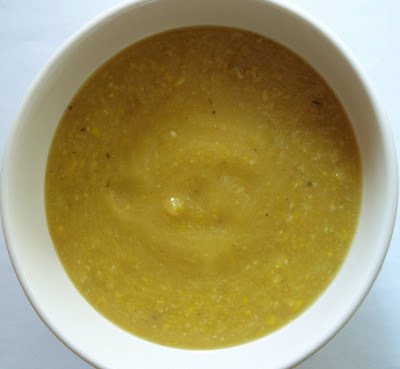 Never having made squash soup before, I opted to do some preliminary research. I didn't find any recipes that tickled my fancy, so I decided to be bold and wing it. 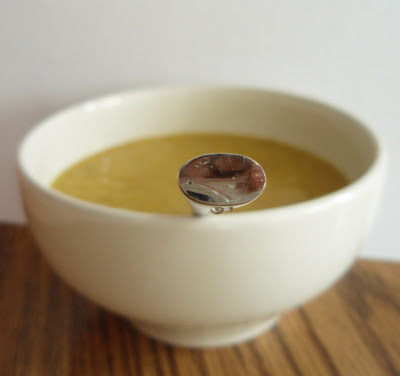 What I ended up doing resulted in a soup with magnificent texture and wonderful flavors. It was exactly what I wanted. -I cut about four normal-sized yellow squashes and one behemoth into chunks and boiled them in some chicken broth until they got mushy. -I seasoned them with salt, pepper, red pepper flakes, and rosemary. -I broke out my immersion blender and pulverized the gloop until it was smooth but a bit of skin and seed still remained visible. -I stirred in some milk, tasted, and reseasoned until it was perfect. Note: Although wonderful chilled, this was particularly delicious heated and embellished with a heap of shredded pepper jack cheese. This may not suit everyone--I have a slight obsession with pepper jack. (can you figure out what's in the reflection? Final note: 'Twas it a good thing I liked my squashed squash because I ended up with about 12 cups of it. "Would you be willing to try one of our cakes in return for a review?" The request came from a representative of Carousel Cakes, and my answer was an immediate and emphatic YES! They even let me pick the type of cake, which I can assure you was no easy task. They have over 20 varieties, including a red velvet cake made famous by Oprah, an appropriately-titled chocolate outrage cake (three layers of chocolate cake filled with creamy chocolate fudge, topped off with an outrageous chocolate icing, surrounded with sweet chocolate chips), and even a strawberry shortcake. They also offer a number of magnificent mousses, cheesecakes, and pies and are happy to make personalized and/or customized cakes. 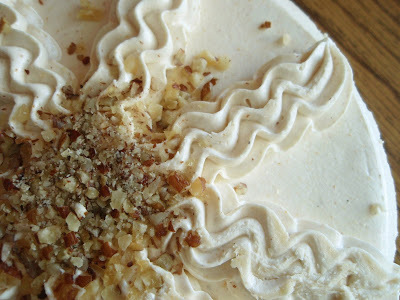 In the end, after doing quite a bit of waffling, I chose the hazelnut torte. 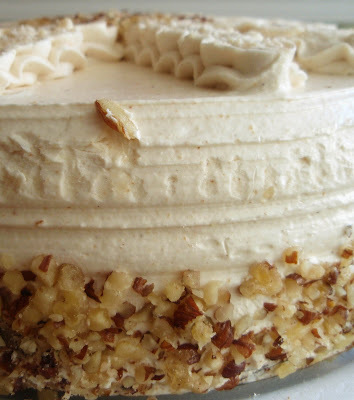 It's described as being "two layers of moist nutty hazelnut cake filled with praline buttercream and raspberry, topped off with praline buttercream," which sounded too tempting to resist. Perhaps you're wondering how it tasted. After all, looks aren't everything. Well, folks, it was truly decadent. The moment the light, smooth, ultra-creamy frosting hit the roof of my mouth, I was in heaven. 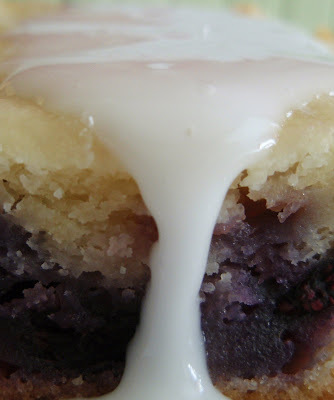 The bit of tartness supplied by the raspberry in the filling was a perfect complement to the sweet icing and nutty cake. Frankly, I could've eaten a lot more than I did--the combination of flavors and textures was such that it was difficult to stop. Although they're located here in NY, Carousel Cakes can ship to any location nationwide so cakes come fresh and frozen, right to your doorstep. They pride themselves on making products with natural and fresh ingredients mixed by hand and with love. The next time you find yourself needing a fancy-shmancy and delicious cake and are without the time or means to make it, I hope Carousel Cakes comes to mind--you won't be sorry! Like many of you, I really enjoy looking at pictures of food. Even if it's a dish that I wouldn't particularly care to eat (fish, anyone? ), I can appreciate a thoughtfully-displayed and carefully-taken photo. I did make some changes (as I'm wont to do), the most obvious of which being an increase in cinnamon. I used whole eggs rather than egg whites and all all-purpose flour and white sugar rather than a combination including whole wheat flour and brown sugar. I also increased the oil a tad. Basically, what I did was make it less healthy. Hmm. Also, instead of just cashews, I used a mixture of cashews and walnuts, and I bumped up the blackberries as well. Preheat oven to 350 degrees F. Butter or coat with cooking spray an 8x8-inch pan. 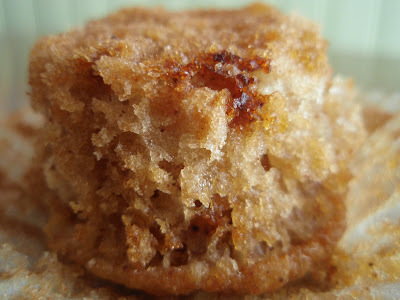 In a medium bowl, combine the flour, baking powder, baking soda, salt, cinnamon, and nutmeg. In a separate large bowl, combine the sugar and eggs. Stir in the vanilla, buttermilk, and oil. Add in the dry ingredients, including the oats, and stir just until incorporated. 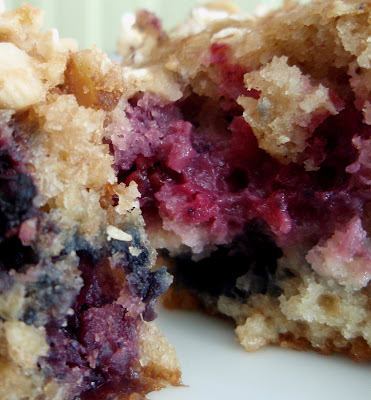 Coat the blackberries and nuts in a bit of flour and then fold in until well blended. Pour the batter into the pan and gently shake it to even it out. 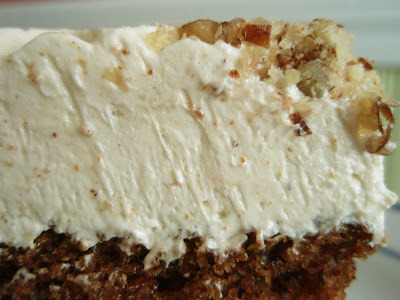 Sprinkle the chopped nuts and oats evenly over the top of the cake. Bake for 45-55 minutes, or until the cake is golden brown and a cake tester inserted deep into the center comes out clean. Transfer the cake to a rack and cool for 10 minutes before unmolding onto the rack to cool at room temperature.